Holy crap, that was fun! I don't hang out with anyone in my class anymore, with the exception of Matt Schoech, whom I see on occasion at Rajiv's. But even that will change, because he's moving out of Rajiv's, and in with his girlfriend. Sellout. Girls age better than guys. All I kept thinking last night was, "This is so weird." To go 10 years without seeing people you're used to seeing everyday, and then to see them all in one place again, is just strange. But it was a good strange. I got to talk to a lot of people last night and catch up on what's been happening in their lives. It seemed like the night flew by. When they turned the lights on at 11pm, I was sad to see everyone go. A friend's parents, who had been divorced for 12 years, have recently gotten back together. A couple of friends, who rumor has it had been separated, "reunited" on the dance floor last night. It was special. I think she's going to be very sore tomorrow. One buddy who is in the Marines is a mountaineering instructor. He teaches Marines how to ski, climb mountains, etc. Oh, and he's deathly afraid of heights. One of my friend's mom moved to Montana. I'm so jealous. Anyway, it was a blast, and I hope everyone had as much fun as me. It was especially nice to catch up with all of my fellow WCS alums: Johannah, Lara, Katie, Janelle, Lina, Rachel… all of them. Special thanks go out to Erin Burke and Tracy Plumb for putting together such a kickass evening. Good job! 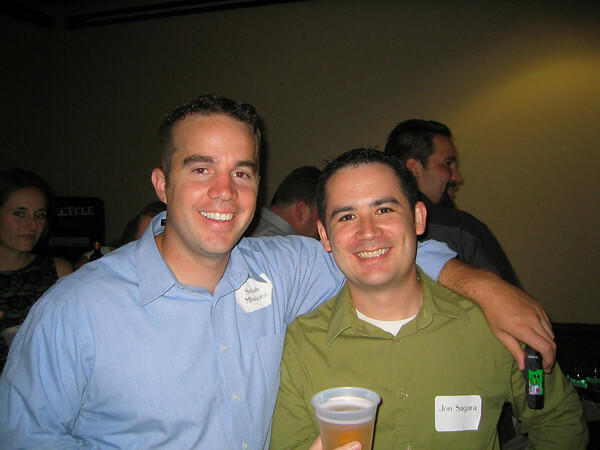 This entry was posted in Blog and tagged people, reunion, us, whs on August 27, 2006 by Jon Sagara.